This is a sponsored post but all the opinions are 100% my own. The Milk-Bone® dog products, information and VISA gift cards have been provided by the Milk-Bone® brand. It is hard enough to get my children to brush their teeth twice a day. I am constantly reminding them. Well Chloe can not brush her teeth by herself and honestly if any teeth get neglected in this house it is the poor dogs. Lucky for us she is a chewer and we provide her with toys that help with her tartar build up. We all give our dogs treats so why not give them treats that brush their teeth at the same time? 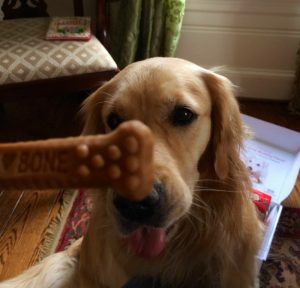 Milk-Bone brand is iconic in dog treats and have been around a long time. 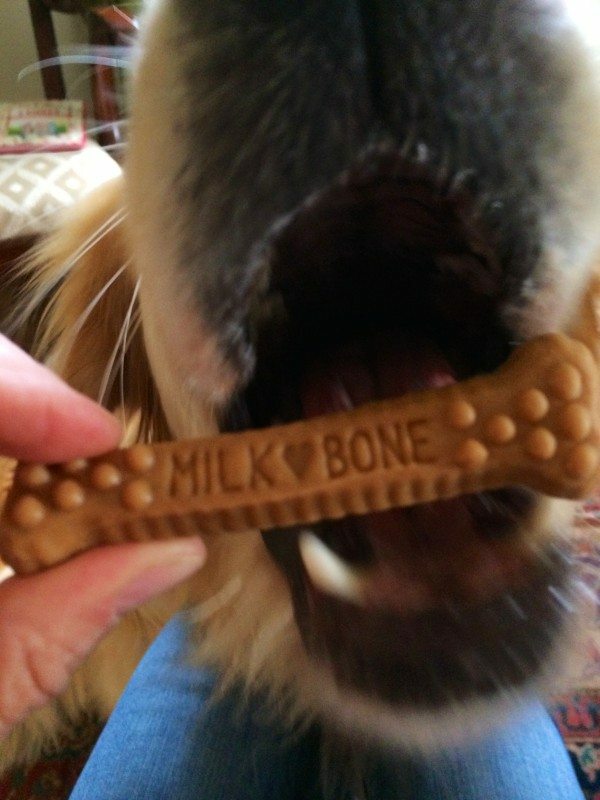 They are now introducing Milk-Bone® Brushing ChewsTM . These dog treats were developed to transform at-home dental care for dogs, so that now your dog to brush his own teeth every day – just like you! Other dental treats I have served Chloe did not seem to have any smell. Well these the dog will gobble up as I think they smell like beef jerky. They come in different sizes depending on your dog’s size. As you can see Chloe is smacking her lips to try one of these. This is her reaction before ever tasting one!! I bet you can’t get your dog to open this wide for her toothbrush!! While it is still very important to pay attention to your dogs dental health, why not help things along by providing her with treats that will not only be an award but help in brushing her teeth too. So much easier don’t you think!! One lucky Close to Home reader has the chance to win Milk Bone® Brushing ChewsTM products and a $25 Visa gift card. Please enter the Rafflecopter below. I try to brush about once a week but sometimes it can get to be a challenge. I always brush them once a day. I usually do it about once a week. Not sure what is recommended. We try to brush their teeth once a week. I brush my dogs teeth twice a week! 🙂 He actually loves it! I brush my dog’s teeth twice a week. I have never brushed our dog’s teeth. I brush my dogs teeth once a week. I brush my dog’s teeth every once in a while to keep them clean. We used to be better at brushing our dog’s teeth but lately we have only been doing it weekly. We use a baby tooth brush to brush their teeth a couple times a week. I never have, but I think these would be good for her since we dont! I try to brush my dogs teeth 2x a week. I try to brush my dog’s teeth about once a week. She doesn’t always cooperate. i have never brush his teeth maybe i should! It’s rare that we brush our dog’s teeth, but they do have a toy that is supposed to be good for their teeth. I guess we don’t brush them nearly as much as we should. I don’t really have a set schedule. We don’t. We had her since Nov.and never thought about it. My family doesn’t with their dogs. I don’t have a dog. I’ll give these to a friend. I don’t brush Sissy’s teeth but I do give her dental chews. I really don’t like getting bit. We don’t! 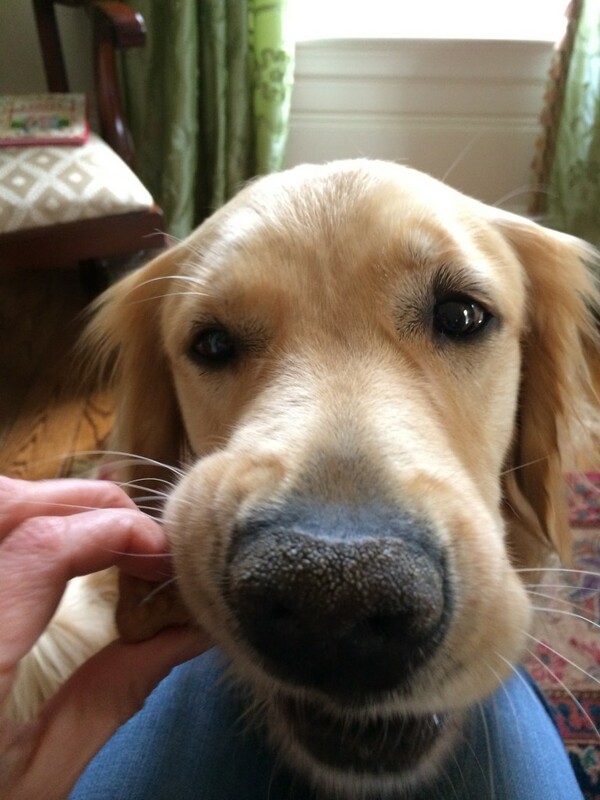 Our golden retriever looks so much like your Chloe! lol She’s a very sensitive dog and won’t let us mess with her teeth or her feet, so she gets her nails trimmed a the vets and we give her rawhide bones to help keep her teeth clean. Thanks for the giveaway! We brush everyday to keep their teeth nice and clean! I brush my dog’s teeth about once a week. I try to brush Shiloh’s teeth several times a week. I need to get in the habit of doing it every day! He’s actually very good about it. To be honest… we never brush our dog’s teeth! His dry food supposedly has dental hygiene qualities, and it must work because his breath is actually pretty decent. We just got our puppy so we haven’t brushed her teeth yet. I will have to ask the vet about that at her next appt. Thank you! Honestly we don’t brush the dog’s teeth. I have a Boxer named Loki and I’m a bad pet parent because I don’t brush his teeth, I give him the dental chews instead. I don’t have a dog, but I think my friend brushes her dog’s teeth once a week. We rescued our dog in september and so far he’s not too keen on letting us brush his teeth, but we’re getting there! He does get dentastix a few times a week and gets apple chunks occasionally which are great for cleaning their teeth. Hopefully as he gets older he’ll let us get in there and brush them. Hi! I don’t brush my dogs teeth. Last year the vet talked my husband into getting a whole tooth brushing kit & it’s never been used. lol I do give him hard & crunchy chews though & he has insurance that covers a teeth cleaning once a year. Thank-you! We actually get our dogs’ teeth cleaned at the vet – they have too much anxiety otherwise! Thanks for the giveaway! I don’t brush my dog’s teeth but I do give them chews. I don’t brush my dogs teeth, I give him the original Milk Bones and I give him some other healthy smile chews. My dogs won’t let me brush their teeth but I do rub toothpaste around on their teeth. I don’t brush my dogs teeth. I don’t brush my dog’s teeth.. I give her rawhides to clean them. I’d like to brush my dogs’ teeth more often, but with five of them and them not wanting to have them brushed, I’m lucky to do it once a week. I do have some tooth gel you put on just before bed but only just started using it. We brush them at least once or twice a week. 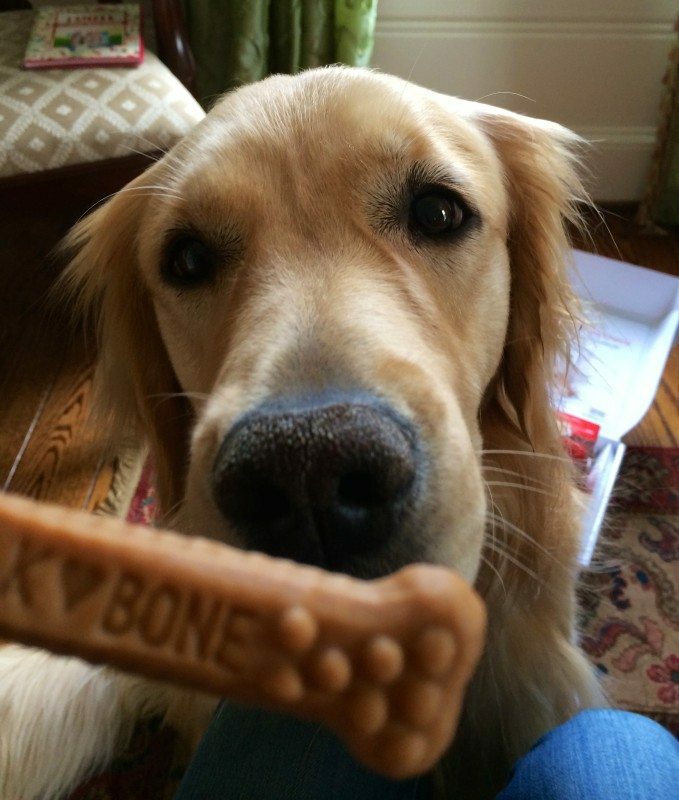 Milk Bone is a brand we trust and this looks like another great product from them. I used to brush my own dog’s teeth monthly, and supplemented with other things. My stepson is too scared to brush his dog’s teeth, and take her to the vet/specialist to do it. I actually have to take my dog to the vet to brush her teeth because she is so timid. It cost a lot of money to have it done that way, that is why I am excited about these new Milk-bone brushing bones. Hopefully it will let me go a bit longer between visits. I try to brush my dog’s teeth about once a week. Her breath gets so bad! My dog breed is prone to getting bad teeth, so I have to brush his teeth every day. I am very concerned for my dog not getting bad teeth and gums. We brush them once a week.